Protesters, who rappelled from the roof of U.S. Bank Stadium after smuggling 65 feet of rope and a large banner through security, did not breach stadium security policies but did expose a “design flaw” in the new billion dollar stadium, according to the head of the Minnesota Sports Facilities Authorities (MSFA). Michele Kelm-Helgen testified before state lawmakers Wednesday about security issues related to the New Year’s Day incident in which protesters unveiled a large banner calling for U.S. Bank to divest from the controversial Dakota Access Pipeline project. 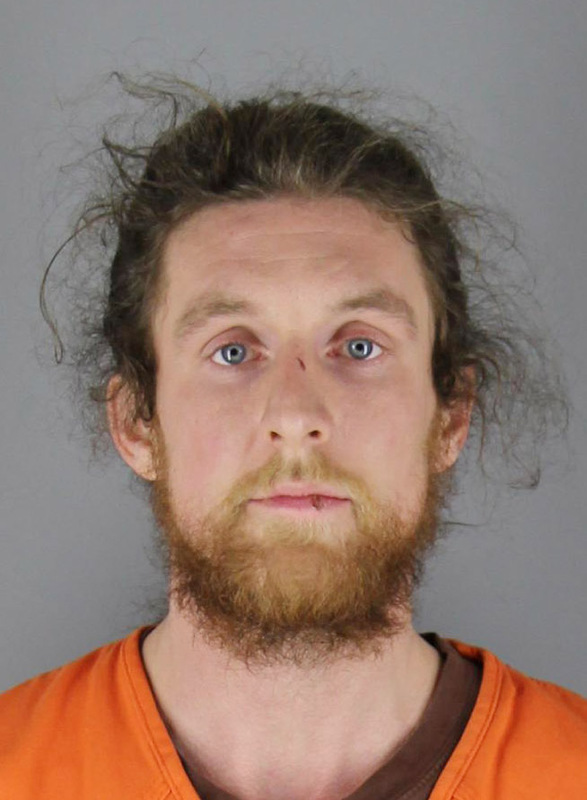 Kelm-Helgen said a group of five protesters did not technically breach gate security because the contraband used to rappel from the roof was not made of metal and therefore would not have set off the metal detectors. Instead, Kelm-Helgen blamed the breach on design issues with secured ladders. “There is actually a ladder to get up to the roof on the ridge truss,” Kelm-Helgen said, adding that preventative measures limiting access to the ladder were not sufficient. “(The protesters) were able to scale that and get up there so that is what is being addressed, is the design issue that allowed them to get (to the truss),” she said. Kelm-Helgen said security will be added in vulnerable areas and a full security consultation will be done to identify other potential areas of exposure. Dr. Stephen Ross, a professor at Concordia University who has studied fan interaction and sports stadium use, says the protesters exposed a “very non-traditional” risk. “In this case I don’t think it was a design flaw with the stadium itself,” adding it would be easy to overlook such an issue during construction. Ross said he is more concerned that the protesters were not flagged while entering the stadium. “While there were no policies against bringing those materials in (to the stadium), it seems interesting the size and the amount of materials needed was able to get through the gates,” Ross said. Kelm-Helgen addressed that concern during her testimony at the capitol, saying it would require security to have fans take off their coats before entering the stadium because the protesters wrapped the rope and banner around their bodies. “Even then it could be under a football jersey,” she added. Dec. 17–The cellphone video of a brawl Dec. 8 at Arrowhead Stadium had everything: Chiefs fans and Raiders fans, swearing and shoving, punches flying and bodies cascading down several rows of seats. It all ended when several Kansas City police officers came into the frame. The video quickly went viral and became a hot topic on sports websites and radio talk shows. It also reignited ongoing concerns about fan safety at NFL stadiums. An analysis by the Washington Post in October showed a slight uptick in the number of arrests per-game from 2011 to 2015. Last year saw 6.34 arrests per-game league-wide, the Post reported. San Diego Chargers games led the league, averaging 24.6 arrests. The Seattle Seahawks were on the bottom with 0.8 of an arrest per game. The Chiefs came in at No. 18, in the middle of the league, with 1.8 arrests per game, according to the Post. The number of arrests don’t necessarily indicate a stadium is more or less violent or dangerous, the newspaper said. Its research found that some teams with the highest numbers have zero-tolerance policies. This season, Kansas City police say they have arrested 16 persons during six home games, an average of 2.7 arrests per game. The arrests included ones for disorderly conduct, non-aggravated assaults, thefts from vehicles and trespassing. The biggest day was Nov. 6, when five persons were taken into custody as the Chiefs defeated the Jacksonville Jaguars. About 200 Kansas City police officers, both uniformed and plainclothes, patrol the stadium and parking lots at each game. Sometimes police will don the jerseys of opposing teams. That force is supplemented by Jackson County deputies, private security guards, federal agents and other law enforcement officers. With an average home-game attendance of more than 75,000, the number of fans packed into Arrowhead Stadium would be comparable to a large city in Missouri, said Major Tye Grant, who oversees off-duty Kansas City police officers working at home games. Security for every home game is well planned, Grant said, and evaluations are done afterward to determine what worked and where improvements could be made. Grant said police made no arrests during the Chiefs-Raiders fistfight. The officers’ first priority was to break up the fight to ensure that fans not involved were not injured. “After I make sure everybody is safe and if there is an opportunity to arrest somebody, then that is what we will do,” Grant said. In addition to a highly visible security presence at Arrowhead, the team educates fans with messages throughout the stadium promoting a code of conduct and encouraging fans to report incidents before they escalate. The team asks fans to report problems using an anonymous text line. Fans can give their section number and the issue they want security staff to address. The team also trains its guest-services staff to find ways to interact more with fans before problems arise. The NFL has sent evaluators to home games to review stadium security measures. One was present during the Raiders game. Unruly fans are sometimes taken to a stadium-security office that has a holding room. They are kept there until a police wagon can take them to one of the city’s patrol stations. Dakota Access Pipeline protesters used tickets to enter U.S. Bank Stadium for Sunday’s Vikings-Bears game and smuggled through security nylon rope, carabiners and the 40-foot vertical banner they unfurled after climbing a truss, according to stadium manager SMG. 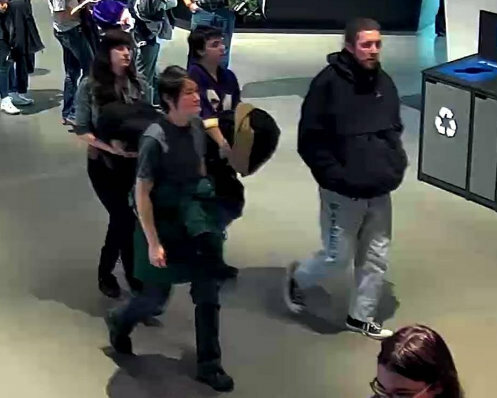 U.S. Bank Stadium surveillance photos show Karl Zimmermann Mayo, right, and Sen Holiday next to him, in all black, bearing the anti-DAPL banner and climbing gear. (Courtesy of SMG) Karl ZimmermannZimmermann Mayo was shown wearing a black, waist-length winter coat inside the stadium while Holiday had removed her coat and was wearing a T-shirt in the concourse photos. Carabiners are hand-sized, spring-loaded clips that climbers and rescue workers use to thread and connect ropes for rappelling. Many are made of metal. “We are not saying a metal detector wouldn’t go off when these individuals went through the security screening if they were carrying metal on their person,” Niess said in a follow-up email. Super Bowl LII is scheduled for Feb. 8, 2018, at U.S. Bank Stadium, and the security breach is drawing NFL scrutiny. 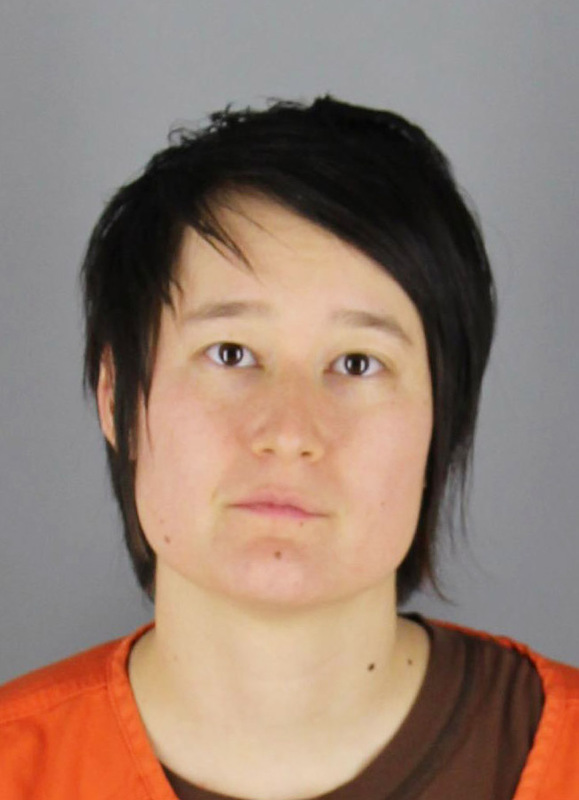 Minneapolis Deputy City Attorney Mary Ellen Heng said prosecutors have asked Minneapolis police to continue their investigation. “A charging decision will not be made until the investigation is complete, which may take a week or two,” Heng said in a statement. 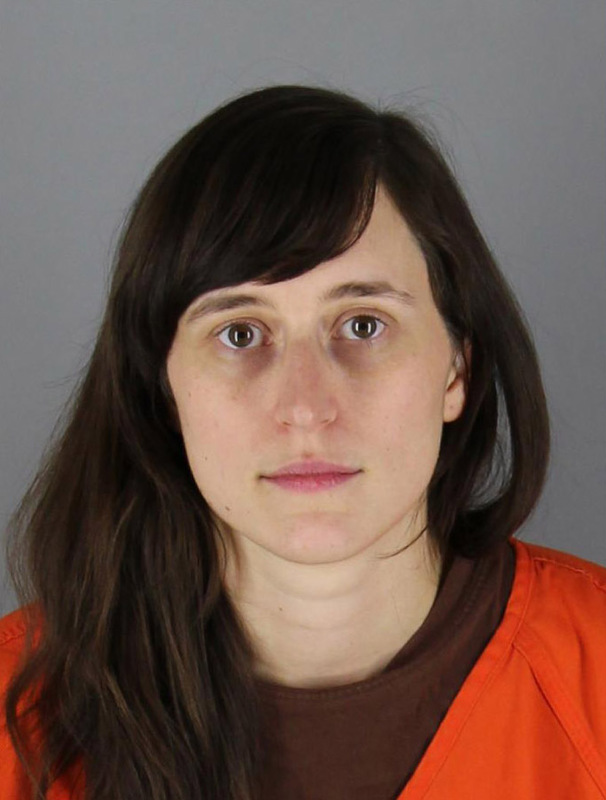 Carolyn Anne Philips FeldmanHoliday, Zimmermann Mayo and another alleged accomplice, Carolyn Feldman, were arrested shortly after Sunday’s game. They were jailed on suspicion of trespassing and gross misdemeanor burglary and released Monday. An attorney representing the trio did not return a telephone call or email seeking comment. Meanwhile, Holiday and Zimmermann Mayo held a news conference a block away from the stadium Tuesday to reiterate their demands that U.S. Bank divest its financing deals with builders of the stalled Dakota Access Pipeline. They refused to answer questions about how they planned the stunt in front of 66,808 football fans, their climbing expertise, tactics or safety risks to them or spectators displaced as a precaution at the start of the second quarter. No one was injured during the protest. However, eight rows of seats in Section 102 were evacuated below the protesters while dozens of Minneapolis police, firefighters and stadium security officers swarmed the base of the truss to strategize how to get the protesters down safely. After the game ended, Zimmermann Mayo and Holiday descended from the truss and were arrested without incident as lingering fans cheered and heckled them. The Vikings said 185 seats were evacuated. The team was reaching out to affected ticket buyers, including 71 season-ticket holders in Section 102, to offer full refunds. Fans who purchased the seats on the NFL ticket exchange also would be refunded, according to team spokesman Jeff Anderson. “We are deeply concerned about Sunday’s incident,” the team said in a statement Tuesday. “The safety of our fans, players, coaches and game day staff is of the utmost importance. Minnesota Sports Facilities Authority, SMG and Monterrey Security officials are currently leading the investigation to understand how this occurred. WALLINGFORD, Conn. – Two people are dead and two injured after a shooting outside a Connecticut theater late Friday night following a concert, police say.